GAS IT EASYFIT, 20 ltr refillable gas tank for Motorhomes by GAS IT as used by autosleepers, autotrail, wildax, vantage, ih motorhomes. - GAS IT Leisure Gas Bottles, Gas Cylincers and Gas Tanks - Catering, Motorhome, Campervan, Caravan, Farrier and Road Repair Refillable Gas Solutions. 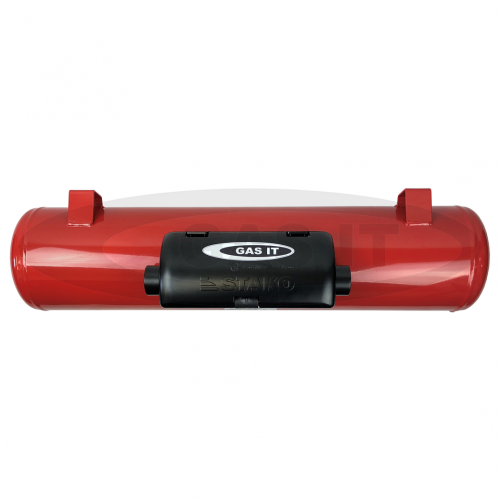 Another very quick and easy to fit, self refillable gas tank from our GASIT EASYFIT© range. GASIT EASYFIT© 200 mm diameter x 20ltr vapour out gas tank's fit direct underneath your vehicle freeing up vital space where your gas bottles would usually be, whilst also putting the high pressure gas out of harms way. GAS IT tanks can be filled at Autogas or LPG stations, anywhere in the world via the vehicles fitted LPG fillpoint. Our GAS IT Manual Tap Option Tanks, like this one, does not need any electrics to operate it as its manual and closes by hand as you would a gas bottle, but unlike a traditional gas bottle, our Manual Tap's as fitted to all GAS IT Manual tanks ever sold comes with a built in Automatic Excess Flow Valve (EFV ) which shuts off the gas in a controlled manor should there be an uncontrolled release of gas from the outlet tap. That's why GAS IT tanks with Manual Outlet Tap are still the best selling refillable gas tanks fitted as its simple, uses no electric and has this EFV built in safety feature. This listing is the 20 ltr tank and pre-installed valves & airbox only. You will need to buy other parts which are all available on our webshop to complete the install e.g. fill point, brackets, hoses, LED display system and so on. Fitment of a EASYFIT gas tank to the vehicle is via the gas tanks own, pre-factory fitted fee, meaning you have a quick, safe and strong mounted gas tank. EASYFIT gas tanks from GAS IT are fitted by many vehicle manufactures in various market sectors in the UK due to there incredibly quick install speed using only a single installer. EASYFIT gas tanks require no separate straps, hoops or frames for mounting and fixing to a vehicle is simple as they only require 4 x M10 bolts & penny washers for fixing through the vehicles steel floor to comply with N1/M1 legal fixing requirements, or as an alternative on pre installed wooden insulated floors we do sell OEM Chassis and Al-Ko brackets for a large range of vehicles. If your fitment choice is directly bolting the tank in place through a steel floor we always recommend this is done in a location where you can gain access to the bolts ( with ease ) at any time in the future. This is so the tank, which might need to be removed due to damage to it or when the vehicle goes in to a paint shop ( Paint oven ) or in 10 years time when the tank needs retesting, can be removed without having to worry about lifting internal floors or fitted furniture. So if in the future you are unable to gain access to the bolts you fit ( when fitting a wooden floor over it for example ) we recommend using our GAS IT through floor mounting system which allows the tank to be removed at anytime from under the vehicle so no internal access is needed. GAS IT Tanks fitted with our manual Tap outlet option is a 21.8LH outlet which require a 21.8LH to W20 pigtail and inline with the NCC Code of Practice 306 the pigtail should be a stainless steel version as it is installed under the vehicle. All GAS IT horizontal vapour tanks ( EASYFIT or Standard) are certified to the UK & EU R67 regulation. EASYFIT© gas tanks come pre-valved, leak tested and with its own manufacturing and approvals certificate plus we sell them with our unique anti corrosion black powder coated protective aluminium valve protection air box. In line with the N.C.C. CoP 306 and also the gas tank manufactures requirements, you must protect your GAS IT tank when mounting underneath the vehicle from mechanical damage caused by stones and road debris. A good quality rubberised underbody spray to help protect and prolong your gas tanks life, and the associated mounting system, from Stone chips and future rust must be applied on install. We sell an underbody spray on our webshop for this application via the install tool and accessories category. Please make sure the rubberised coating on the tank is checked at least once a year and recoated in any areas that have been washed away by general road wear. Failure to protect the tank against stone chips and mechanical damage on install will invalidate any warranty on the tank and mounting system. All GAS IT self refillable gas tanks are fitted with an automatic 80% float driven shut off filling valve, meaning it will automatically shut off the filling gas pump when the GAS IT tank becomes 80% full. This size GAS IT gas tank is also available without ourunique EASYFIT© mounting feet. Please note the diameter quoted is the size of the tank only and does not include the extra size of the valve box on the side as seen in the picture. All sizes are approximate.